With just two months to go until the Model Railroad Garden opens, one dedicated group of volunteers undertook a big job this week: cleaning and retouching the 500+ miniature figurines that accessorize the garden’s landmark buildings. Led by Becky Maganuco, volunteers got out the toothbrushes and toothpicks, the glue and the triple-zero paintbrushes, and set to work. Becky gets the boxes of miniatures out from winter hibernation. It’s good to see familiar faces! 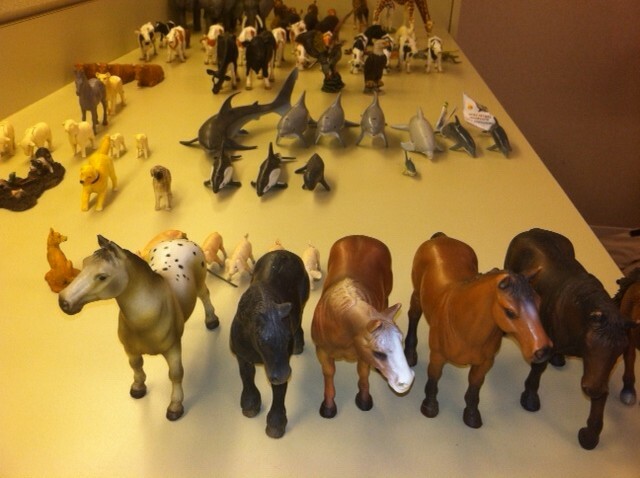 An ark’s worth of animals prop the Model Railroad Garden’s landmarks. Over the course of several days, they washed (the cars, trucks, and tractors were especially dirt encrusted), touched up paint (eyes and eyebrows are the trickiest), and glued back the tiny hands and feet that are inevitably broken (weather, errant human footsteps) during five months spent outdoors in the Model Railroad Garden. 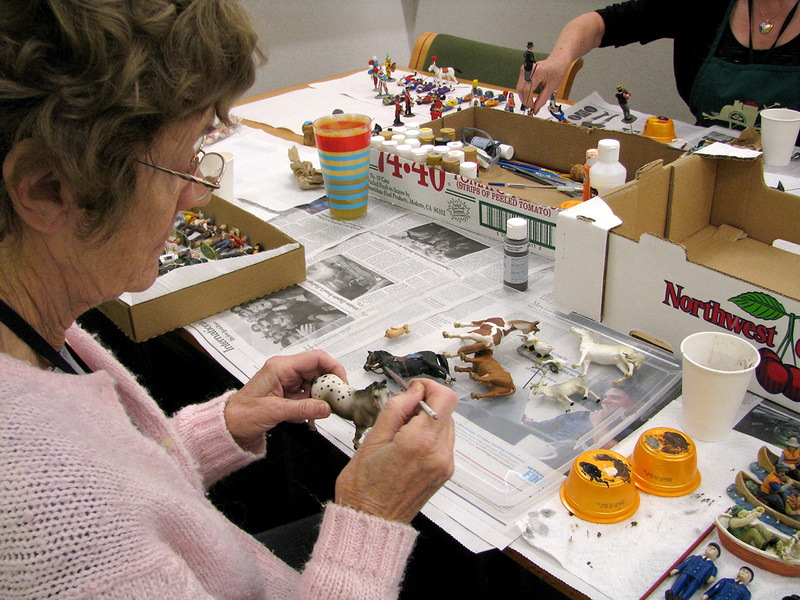 Railroad Garden volunteers George and Judy Knuth sorted, organized, and repaired figurines. An appaloosa horse gets fresh tiny, tiny spots in volunteer Gerry Lewis’ expert care. I always look forward to the May days that Becky and fellow miniaturists, many of whom are members of Northbrook’s North Shore Miniature Society, accessorize the garden. It takes them a couple of days to layer in all the right details: the barber pole on Main Street…the sunbathers and sailboaters on Cape Cod…the lone wolf and the bears in Yellowstone National Park…even Bo the dog at the White House. Their work makes the buildings come to life, and never fails to delight—key factors in a garden that’s especially for children, for whom the magic and humor of the small will always trump the realities of life-sized. 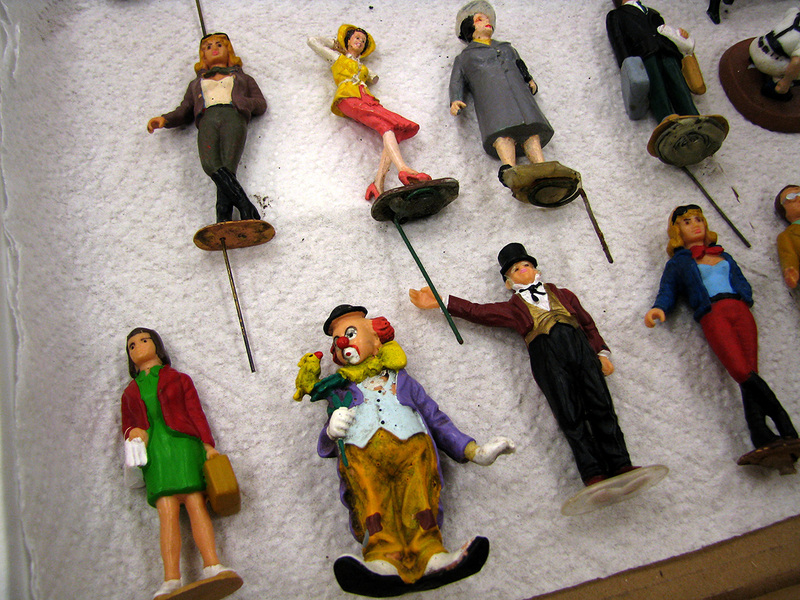 Freshly painted figurines—some for circus, some for city—drying in an organized fashion. There’s a practical side to their miniature work as well: “Visitors take close-up pictures and use telephoto lenses a lot in this garden, so it’s nice to make the details look a little more real,” says Becky. What’s new for 2013? Volunteers are mulling how to accessorize the most recently added landmark, the Lincoln Memorial. Posted on March 17, 2013 January 3, 2014 Author Karen Z.Categories Behind the ScenesTags miniatures, model train, railroad garden, volunteersLeave a comment on Miniature maintenance!